Come enjoy the lake from this cozy, fun cottage -with the best view of the lake! Each season of the year has its own charm at the cottage and on the lake. Spring and Summer are the best times to enjoy the sun outside and on the lake! The cottage feels like you are at a cabin up in Maine. It has a rustic feel and it is on a quiet lake where time seems to have been forgotten. It is literally right on the water, as you can see in the pictures. The cozy cottage is perfect for a vacationing couple, or two, or a family.The waterfront cottage has 2 bedrooms with queen beds and a spacious living room. The large screened-in porch is a favorite place for meals overlooking the water. A large oak tree provides shade with picnic tables, chairs, and a hammock viewing the lake. The kitchen is fully stocked and ready, just bring your food. There is a gas grill and two outdoor fire pits which also overlook the water. Kayaks and a canoe are provided for your use at no additional charge. We also have horseshoes, old bikes, internet, DVD player, basic TV, a few lawn games and indoor games. If you choose, we have a discount paddleboard rental for just $20, and hot tub rental for $100 or less depending on the length of your stay. (We can not guarantee hot tub availability.) The tub sits over the water and under the stars, or enjoy a campfire with firewood provided with no charge. We also have a massage therapist that you can schedule a massage with, right by the lake. And, if you are interested, I am an artist and can offer you a “paint night” customized to your requests. Furthermore, I am a portrait photographer, and can also offer family/child/couple/individual portraits if you want! There is also a small, organic "Earth Friendly Farm" that sells vegetables at the beginning of your street. 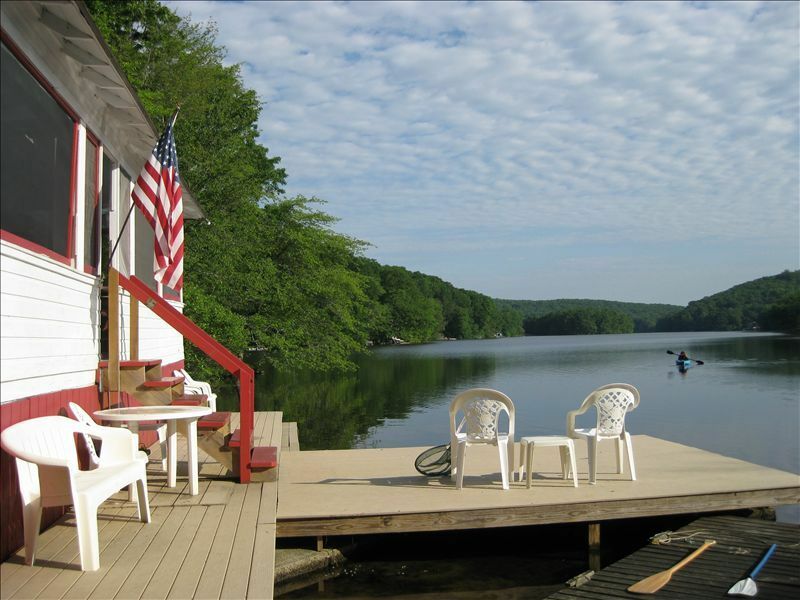 Stay at the cottage enjoying the serenity of nature and the lake, or, you are just a 10 minute drive from Mystic-- a favorite tourist town, 5 area wineries, the Connecticut Shoreline, and 5 minutes from Foxwoods casino. Take a walk or a bike ride along the coast, through Mystic, or in the woods such as up Lantern Hill. You can also enjoy activities in Westerly Mystic and New London such as weekly free outdoor summer concerts or other attractions at MysticCountry.com. -Holmberg’s Orchard in Gales Ferry is a beautiful place to go pick your own fruit of the season, whether that’s blueberries, peaches, raspberries, apples, or even nectarines this year. Tractor rides will bring your family to the perfect picking location. In the fall, there are fields of pumpkins, as well as squash, gourds, Indian corn, hay bales, and mums. There are also events, such as Farmer’s Markets. -The Mystic Seaport Museum, a ​Historic Whaling Village from the 1800’s, has many attractions indoors and outdoors, with incredible sights and tours of historic ships. ​- The Pequot Indian Museum is very interesting and ​Smithsonian-quality. Interactive for children and quite educational. Open Wed- Sat 9am-5pm, a 6 minute drive from the cottage. -If you’re looking for a sunset excursion and tour of the Mystic River, my brother has an inflatable boat and is willing to give boat tours for our cottage guests for a small fee. -If you would like to indulge in New England’s fresh seafood, be sure to visit the restaurants and markets in Pawcatuck, Mystic, Stonington CT and Westerly, RI. If you need directions or recommendations, please ask us for more information. -MYSTIC has a variety of restaurants, both casual and high-end. Some popular places include: Mystic Pizza, Pizzetta, S & P Oyster House, Latitude 41, the Engine Room, Bravo Bravo, and Go Fish. Karma Kitchen is a healthy cafe with smoothies, nutritious juices, acai bowls, & more. Drawbridge Ice Cream is very popular on the bridge. -Bluff Point - ​This is a beautiful 2.5 mile round trip dirt road that you can walk or bike on. Beautiful views of the shallow waters, and open ocean with sandy beach at the end of the road..
-Haley Farm State Park is a popular trail for biking or jogging, along with Bluff Point. ​- Long Pond of course! You are welcome to take the kayaks or the raft and bring them over to the nice rock areas of Long Pond to swim off of. If dates are full or if you are looking for a second rental nearby for a family and friends, please check out our other cottage on this same lake. The listing is HomeAway #3945127 to see pictures and reviews. If you have trouble finding it, just send us an inquiry and ask. Book early if you need specific dates. Note that we have a discount for stays of 7 nights or more. We are happy to answer any questions you may have, email us for more information or ask us to call you back. Hi, my name is Molly. My father is Bobby, and we work together to continue improving the cottage and doing our best to ensure that you have a wonderful time here at the lake. My father and I have both grew up spending much time enjoying the cottage and the lake with our family. His parents bought the cottage back in 1955, and now- three generations later- the cottage is an ever more special place for us, and we very much enjoy our family's vacation there each year. Now, we love to share our special place with others, and it means a lot to us to hear from guests about their good times here with family, friends, and loved ones. Included in the lakeside house are 2 kayaks, 1 canoe, and a large Huck Finn style raft to swim off of or to explore the lake and the connecting lake. There are two campfire areas and a propane grill, horseshoes, badmitten in the yard. All are included in the price of the cottage. If you bring your fishing rod, the fishing is great. We also allow you to bring your dog along to enjoy the lake. The cottage is great for family activities and for relaxing meals and sunsets. The house sits right at the edge of the lake, with a deck built overhanging the water. Small window air conditioners are added in the bedrooms during the peak summer months of July and August. Most months, the lake breezes are all that is needed. The kitchen, bedrooms and bathroom are newly insulated and have heat. The living room is not well insulated but the wood stove heats it up nicely. The wood stove makes the living room very cozy in the fall. Wood is provided. There are comfy couches that are suitable for sleeping as well. There are extra blankets in the bedrooms. Nice lawn with horse shoes, two fire pits, picnic tables, and a tree swing. House sits on the edge of the lake and there is gentle sloping access to walk into the lake. Kayaks (2) and canoe (1). Lifejackets included. Outdoor hot tub sitting on the edge of the lake. There is an additional maintenance fee for this extra feature. Most guests choose to bring their own sheets and towels. We can supply sheets and/or towels for a small fee if you notify us in advance. You are welcome to call or email us and we will answer any questions about the cottage, the lake, the surrounding area, tourists activities or nature activities. There is space for several cars to pull right up to the front of the house. Small window air conditioners are added in the bedrooms during the peak summer months of July and August. Usually, the lake breezes are all that is needed. Great atmosphere. We came for our honeymoon and it was great. The location allows for the perfect amount of privacy but then a short drive away there are a lot of in town options. We visited local wineries, the spa and restaurant's. Went to downtown Mystic, which was relaxing. We ate at Mystic pizza(so good) and did some shopping. Rhode Island is a short drive away and was pretty and scenic. The cottage view of the water any time of the day was gorgeous but early morning was breathtaking. The stars at night while in the hot tub were beautiful. Neighbors were quiet. The rustic, old cottage atmosphere made you disconnect from a normal busy days schedule and calm down by the fire place. Definitely would recommend. The hosts we're friendly and helpful. The price is more then fair. It was relaxing and comfortable. The owners made sure you had everything you needed and were available via text with any questions needing answering. I can’t say enough good things about this quaint cottage. It was a wonderful place to spend and ring in the new year. The owners were also very quick to respond and check in to ensure we had what we needed. We will def be back! This home is very clean and functional. Molly and Bobby were very attentive and did whatever they could to assure that we had a great time. We visited in the winter and would love to come back in the summer too. The place was so much better thank pictures. So pretty and relaxing. Nothing like sitting in the hot tub with a glass of wine taking in the wonderful view. Can't wait to go back. DRIVING DISTANCES: 5 minutes to Foxwoods, 10 min to downtown Mystic, 25 min to New London, 20 min to Mohegan Sun, 25 min to Rhode Island's beautiful beaches. Also nearby is the Mystic Seaport, Mystic Aquarium, Mashantucket Pequot Museum, and several wineries. GPS address marker is our driveway entrance. Cottage sits on the edge of the main lake. You would never know it when you're at the lake, but Foxwoods casino and outlets is a 5 minute drive through the woods. $30/pet because additional dogs are additional cleaning and ware and tear... Please let us know if you have more than one dog, thank you!